Designed as a tribute to one's uniqueness, this Cluse La Roche watch features a genuine white marble dial, produced from a raw stone. Every piece of marble is one of a kind with a natural veining pattern, which makes each La Roche timepiece entirely unique. Loyal to the minimal aesthetic, this collection features a 38 mm stainless steel case with a brushed rose gold finish and a rose gold mesh bracelet for a bold and stylish look. 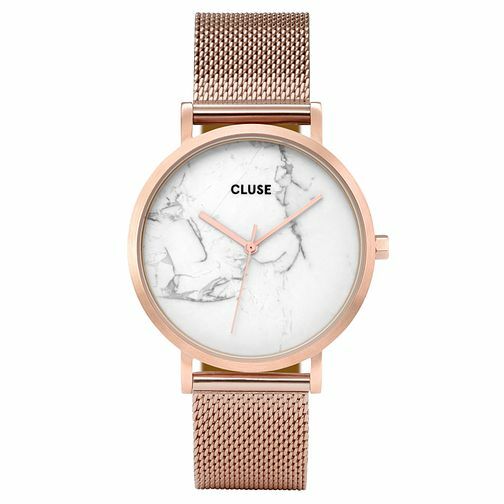 Cluse Ladies' La Roche Rose Gold Mesh Bracelet Watch is rated 5.0 out of 5 by 1. Rated 5 out of 5 by Anonymous from It's just gorgeous!!! I've wanted this watch for a few years now, it arrived the date it said it would, and I haven't had any problems with the watch. I'm just really happy with it. It's beautiful and so easy to put on. I love it!! !